What does best even mean? Especially if you're the biggest by far. The issue may be like obscure soccer or baseball statistics; important only to the cognoscenti. What matters most to web retailers are three things: Traffic, engagement and conversion. Amazon gets more visits in a typical month than EBay, Walmart, Target, Best Buy, Macy’s and Costco combined. 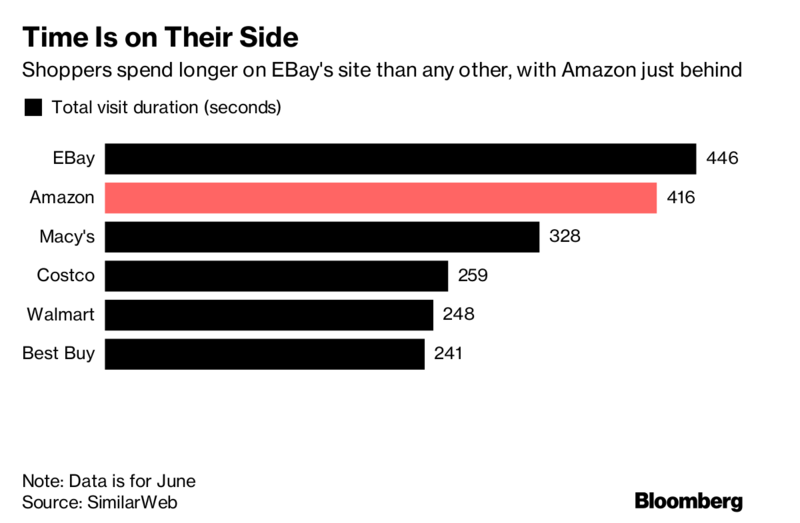 EBay and Costco both have lower bounce rates than Amazon. For Walmart, half its visitors leave after viewing one page says its shoppers aren’t as engaged. 7 out of 10 online shopping trips end with no purchase made. Amazon converts shoppers into buyers better than its main rivals, and it’s not even close. Amazon.com Inc.’s dominance in online retail is clear to see: The so-called Everything Store captures 49 percent of retail e-commerce sales in the U.S., thanks in large part to its 95 million-strong army of Prime customers, who in July contributed to an estimated $4 billion spent globally in just 36 hours during a promotional binge that Jeff Bezos created out of thin air. For comparison, that’s more than Church & Dwight, maker of Arm & Hammer baking soda and Trojan condoms, generates in a year. So Amazon’s the biggest shopping site in the U.S. But is it the best? And how does one measure that, anyway? A common way is to look at how much of a retailer’s total revenue comes from its online division. By that metric–simply, who does the biggest share of their business online–Amazon is worlds ahead of most rivals. That doesn’t tell us very much, though. For one thing, that metric is declining at Amazon as the company evolves: It now owns the Whole Foods Market grocery chain and also gets almost 12 percent of net sales from its successful cloud business. 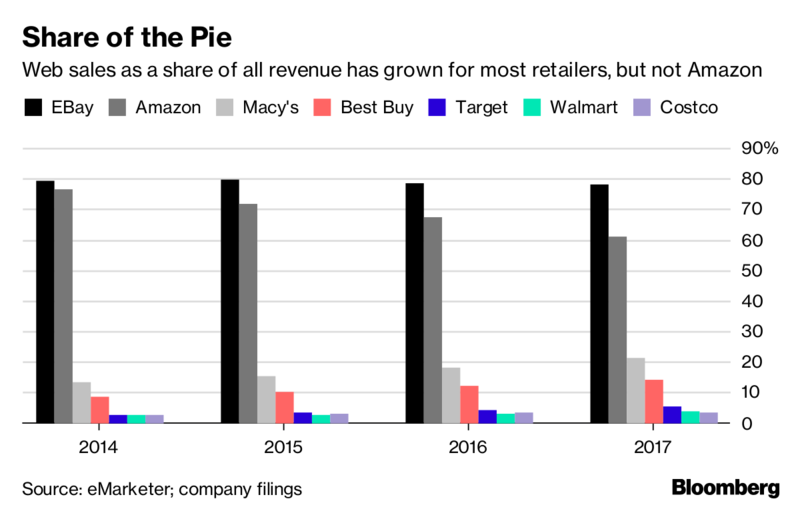 At Walmart, meanwhile, the online unit is expected to grow 40 percent this year, but it will never be as big of a slice of the pie given that the company operates more than 11,000 brick-and-mortar stores around the globe that deliver about a half-trillion dollars in sales. Discussions about online sales usually devolve into comparing deals. But it’s not just about who has the lowest prices–most sites these days employ algorithms that can quickly match competitors’ price tags, so they’re changing constantly. (During Prime Day, Amazon took 40 percent off the Instant Pot cooker, a foodie favorite, prompting Walmart and Costco to follow suit.) Executives at Walmart, the king of everyday low prices, now talk less about prices and more about “reducing friction” for online shoppers–or making the shopping experience faster and easier. And while product assortment is important, it’s more than who carries the most stuff. Consumers can get lost in a sea of online listings in much the same way they get confused when they’re staring at 52 different brands of toothpaste in a physical store. There are other ways to measure online sales success, like downloads of a retailer’s shopping app. Of course, just having an app on your phone doesn’t mean you’re shopping regularly–how many unloved apps sit gathering digital dust on your smartphone? Even metrics like the time spent on a site can be misleading: While advertisers love it if you linger, a retailer generally wants to get you to the checkout page as fast as possible, or else that could be a sign that navigation isn’t working so well. In truth, what matters most to web retailers are three things: Traffic, engagement and conversion. In other words, how many people visit your online storefront, how interested they are in what they see and how many of them click the all-important “buy” button. Let’s start with traffic, measured by site visits. No surprise here: Amazon gets more visits in a typical month than EBay, Walmart, Target, Best Buy, Macy’s and Costco combined. One reason is Amazon’s strong referral business, whereby other websites, dubbed affiliates, send traffic to Amazon and collect a fee. Around 6 percent of Amazon’s traffic in any given month comes from those referrals, according to researcher SimilarWeb, double that of Walmart and Target. But traffic doesn’t tell the whole story. It can increase without delivering any perceptible boost in sales, and a sudden spike in traffic can cause site glitches that prompt shoppers to go elsewhere: witness Amazon’s Prime Day trouble, where some early searches for goods prompted an error page featuring dog photos. Shoppers who leave a site after viewing just one page are said to have “bounced” in web parlance, and that’s not a good thing either. It’s the online equivalent of a customer who walks in a store, takes one look around, and walks right out. 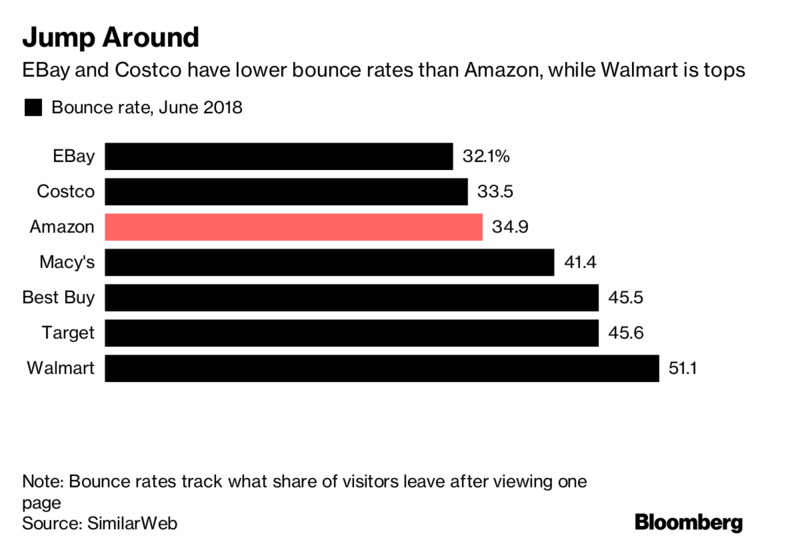 EBay and Costco both have lower bounce rates than Amazon, a sign that the visitors coming to their sites truly want to be there. For Walmart, meanwhile, having half its visitors leave after viewing one page says its shoppers aren’t nearly as engaged. That might explain why the company unveiled a website redesign in May, with new colors, fonts and lifestyle-focused imagery–for example, pictures of cute babies in a kitchen rather than a boring photo of a stroller. Those baby pictures are just one of many ways e-commerce sites try to lure millennials, who devote a greater share of their spending to the web than any other age group, according to UBS. Ebay, for one, is launching personalized shopping pages and boosting its marketing spending to freshen its image as an online rummage sale. 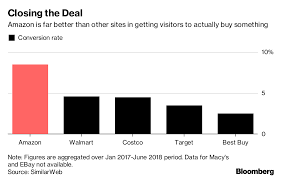 Walmart and Costco’s web visitors also skew older, which makes sense given their more mature shopper base. Still, even Walmart is trying to get younger, taking a page from Jet.com, the urban-focused startup it acquired in 2016. 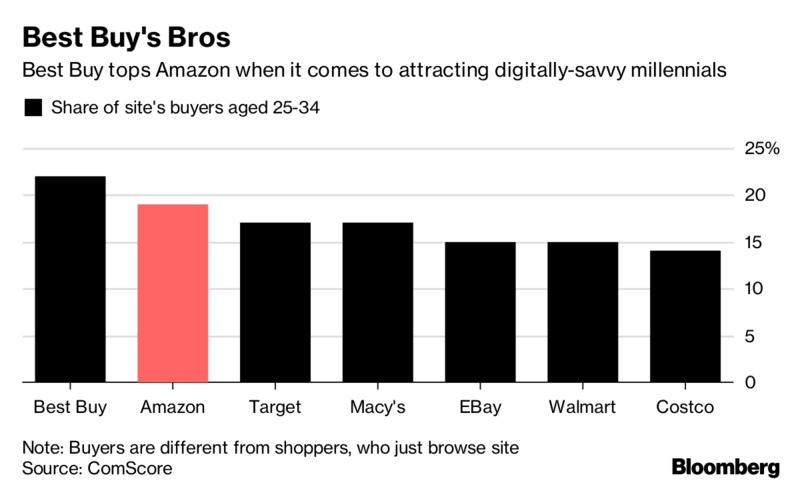 Turns out the winner among millennials isn’t Amazon but Best Buy, where more than one in five shoppers are between 25 and 34. One reason is simply what it specializes in: gadgets. But the consumer-electronics retailer has also vastly improved its website in recent years with a better search function, more reviews and detailed product information. That’s helped the company more than double the proportion of its U.S. revenue that comes from online to 16 percent last year, up from 7 percent in 2012. No matter their age, online shoppers are a fickle bunch. The Baymard Institute, an e-commerce researcher, has found that about seven out of 10 online shopping trips end with no purchase made. Shoppers abandon their virtual carts for a variety of reasons. Most often, it’s because shipping and other fees are too high. Others find the checkout process too complicated, don’t want to create an online account, or didn’t trust the site with their credit card information. All those factors can hurt a site’s conversion rate, which is the share of shoppers who actually buy something. “You want shoppers to be engaged, but conversion is the ideal metric,” says Nathan Rigby, senior vice president of global sales at One Click Retail, which monitors e-commerce sales. Amazon converts shoppers into buyers better than its main rivals, and it’s not even close. With simple one-click (or one-swipe) checkout and “Subscribe and Save” discounts for household goods purchased regularly, Amazon, for now, closes the deal better than anyone. And that, more than anything, makes it the king of e-commerce.But with rivals starting to catch up, there's no guarantee Amazon’s dominance will last. One Click Retail’s engineers are hard at work developing a new e-commerce yardstick, one that will combine traffic, conversion and revenue into one metric called “TeComm,” short for Total E-commerce. Once that rolls out, it will be easier to see who’s got the biggest leg up in digital sales. It should appear next year — perhaps just in time for Prime Day.